Be aware, Americans! 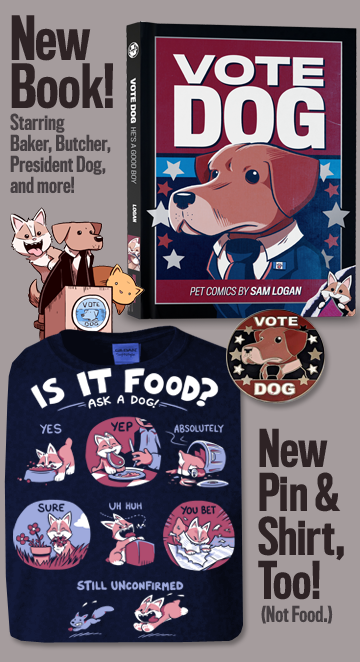 If you would like to nab some Sam and Fuzzy swag in time for Christmas, we can still get it to you in time if you choose express shipping... but only if you order by December 17th! And speaking of deadlines, this Wednesday (the 18th) is the last day to get in on our final book club bonus pack of the year! Bonuses will be emailing out on Thursday or Friday, to everyone who has purchased a copy of Sam and Fuzzy Under the Influence. (Or who backed our kickstarter!) There is still time for this to be you. We return on Wednesday with our next comic. See you then! I'm really sorry about the server issues, everyone! I know the site was taking forever to load over the last day or two. I think we've got it all straightened out now, though, so cross your fingers! In any event, enjoy today's comic! (And Wednesday's too, if you missed it due to the downtime.) We return on Monday with the next one. Just a reminder, international buyers... today is the last day you can order Sam and Fuzzy swag with express shipping and receive it in time for the holidays. After today, the merch will still come, and it will still be awesome, but it probably will not arrive until January. You have been warned! 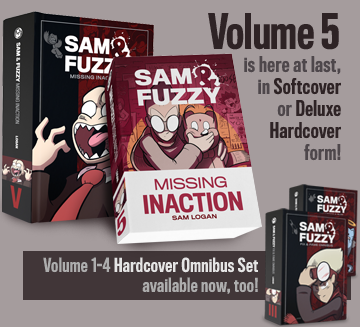 And speaking of reminders... there is now only one week left to get in on our latest Sam and Fuzzy Book Club bundle! If you'd like to score all our free Street Fighter, Teenage Mutant Bender Turtleducks, and magazine parody desktop and mobile backgrounds, make sure you nab a copy of Sam and Fuzzy Under the Influence by Dec 18th (either alone or in a book bundle). If you have already bought the book, or contributed to the kickstarter, you are already signed up to receive these bad boys on the 19th, and don't have to do a darn thing! Easy, right?